Furloughed government workers affected by the shutdown hold a silent protest against the ongoing partial government shutdown Wednesday on Capitol Hill in Washington. WASHINGTON — As furloughed federal workers endure their fifth week without pay in what is now the longest partial government shutdown in U.S. history, their missed paychecks are adding up: A new study estimated that workers affected by the shutdown will be owed $6 billion by the end of this week. 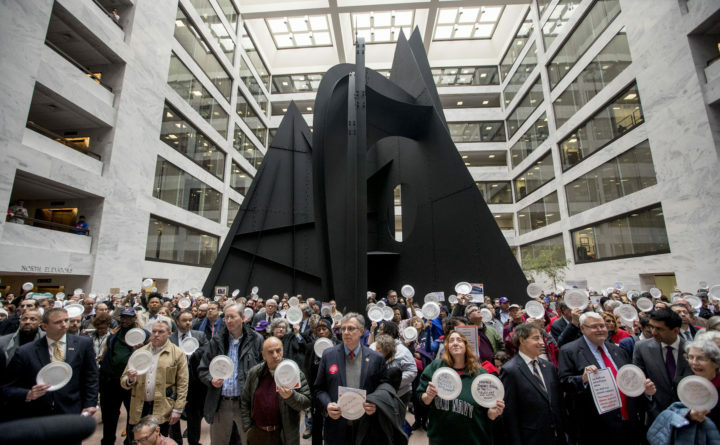 While circumstances vary — some workers are off the job while furloughed, while others are working without pay — it’s estimated that roughly 800,000 workers have had their pay interrupted by the shutdown. The study from Sentier Research, an Annapolis, Maryland-based research firm, used data from an annual household survey by the U.S. Census Bureau to create a sample of 833,000 federal workers, and found that the average furloughed worker has lost $5,600 in wages thus far in the shutdown. Collectively, these workers are owed $4.7 billion. The number will jump to $6 billion at the end of the week, when many will miss their paychecks for the second time. That figure is triple the back pay racked up in the last major government shutdown in 2013, which lasted 16 days. Wages lost by some 850,000 federal workers amounted to roughly $2 billion, according to a study from the U.S. Office of Management and Budget. The economic impact of lost wages will extend far beyond the lives of individual workers. The fallout could dampen consumer spending, which accounts for more than two-thirds of the U.S. economy, which would spell trouble for restaurants and other small businesses. This month, the University of Michigan’s widely watched index of consumer sentiment plunged 7.7 percent, hitting its lowest point in the Trump era. A common rule of thumb, based in part on a Congressional Research Service analysis of the 2013 government shutdown, is shutdowns shave about 0.1 percentage points off economic growth for each week that they drag on. The effect is expected to grow over time as a complications compound. At the time, the Commerce Department estimated the 16-day shutdown dragged down economic growth about 0.3 percentage points in the fourth quarter of 2013, about in line with the high end of such assumptions. Growth figures are annualized and adjusted for inflation.